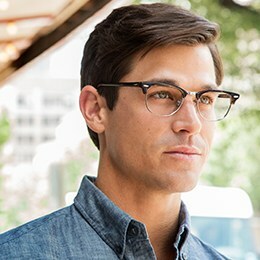 In this video, we describe what eyeglasses frame shapes to consider for a male with a triangular face. - - - - -A triangle shaped face is one with a slender forehead and eyeline that widens at the cheeks and chin. For the best look, you should target semi-rimless frames that will accentuate your upper face. Also, top-heavy styles are great to balance out the width of the jaw. You can see examples of frames for triangular faces on our Face Shape Guide.